Contemporary architecture is characterized by constant research into shapes, forms and materials. Conventional expressions and established constructions techniques are making way for new and unusual solutions mainly linked to the use of innovative materials, the different use or combination of known materials, and going beyond conventional functional and structural patterns. The most significant examples feature a mighty technical gesture in their DNA, while their expression tends to sobriety, essentiality, harmony between nature and artefact. We are also designers, this is why we can exchange views with other designers. We manufacture the parts that make up our architectures, and this is why everything we make is done by us down to the smallest detail, assembling and maintaining our designs and providing continuous service. The designs we have made and built with our clients stem from this synergy. We aim for the maximum visual result from classic forms and from modern lines: steel, aluminium, wood, fibreglass, textile membranes, choosing the most appropriate material for each use, without preferences. Constant research into new functional and design solutions has led us to develop innovative solutions such as Texo, an experimental modular panel, a “new textile skin” that brings architectures back to life.From lightweight structures connected to the philosophy of natural forms, since the early 1980s, Tensoforma has been researching new and unusual solutions until achieving structural systems based on the use of technical textiles for the construction of building envelopes that ensure high visual, mechanical, thermal and energy performance. 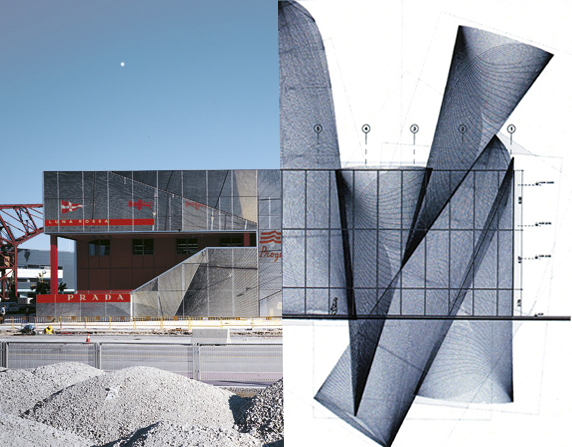 Shanghai World Expo 2010, America’s Cup Base Lunarossa, Batumi Airport (Georgia), Prada, MiuMiu, Fabrica and Benetton Group and Brescia Musei are just some of the projects we have implemented. We thank our clients that have given us the opportunity to make significant works in almost every continent.